This book captures the spirit of the main title, while condensing it down into a great self-contained story. 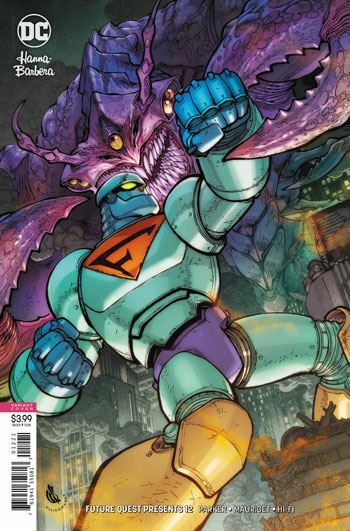 Whoever it was at DC editorial that decided to do one off stories featuring the Hanna-Barbera action cartoon characters deserves a pat on back. The main Future Quest title was such a blast, it would be a shame to not continue forward. 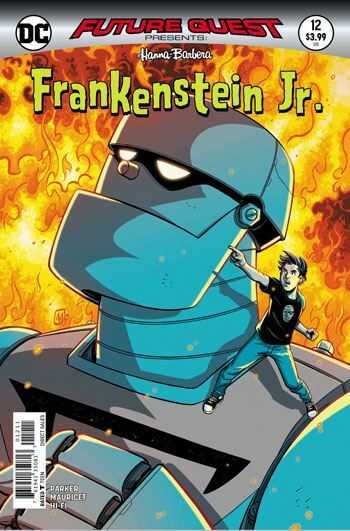 This particular issue of Future Quest Presents focuses on the world of Buzz and his robot Frankenstein Jr., with a dash of Jonny Quest and Birdman. The action begins when Dr. Zin (a Jonny Quest villain) alerts Buzz's mother (who is also the inventor of Frankenstein Jr. the giant robot) that the evil organization F.E.A.R. has been experimenting on animals to create giant monsters. If that doesn't sound great to you then I don't know what you come to comics for. The art is also a big plus for Future Quest Presents. Alan Mauricet does a wonderful job of capturing the 60s, James Bond-like feel of the cartoons. When I think of Future Quest, I think of great classic comic book art and this issue holds that standard true. All in all, I highly recommend this book and this series. If you know the characters in detail, there are wonderful Easter eggs throughout that will satisfy your nostalgia cravings. But even if not, Jeff Parker does an excellent job of crafting a fun and easily accessible thrill ride.